Difficulty concentrating can be one of the most subtle, yet unsettling, menopause symptoms. It can be frustrating to experience a decrease in concentration ability, and this may lead to doubts about aging and concerns that a more serious condition could be at play. By learning more about difficulty concentrating as it commonly appears during menopause, these fears can be allayed and women can breathe a little easier. Keep reading to learn more about difficulty concentrating, its definition, symptoms, and when it may be a sign of something more serious than simply menopause. Because the warning signs of this symptom can be subtle, it is helpful to first define what constitutes difficulty concentrating. Difficulty concentrating is defined as the inability to concentrate on both everyday as well as unusual or complex tasks. Along with this, women may experience disorientation, general forgetfulness, and lost trains of thought. This can be a cause for concern for many women who can typically concentrate without much effort, and may lead to problems in the workplace or in their personal lives. In addition, women may feel some concern that this is an early sign of more serious conditions, such as Alzheimer's. Keep reading to learn more about the characteristics of difficulty concentrating as it appears during menopause in order to recognize the difference between this menopause symptom and underlying cognitive conditions. Difficulty concentrating is an umbrella phrase for a menopause symptom that envelopes a larger host of cognitive issues. The box at the right shows some of the most frequently experienced symptoms that women may experience. These symptoms, though annoying, are all perfectly normal. However, if the difficulty in concentrating is combined with other symptoms or reaches more severe levels, it may be a good idea to visit a doctor. Keep reading to learn more about possible warning signs. In most cases, difficulty concentrating is a perfectly normal occurrence during menopause and should not be cause for concern. However, as Alzheimer's can be a cause of concern for aging women, the signs should not be overlooked. There is a distinct difference between experiencing difficulties concentrating and experiencing signs of Alzheimer's disease. In most cases, it is not necessary to feel alarmed. If a woman is experiencing one or more of these more serious symptoms, it may be wise to seek the advice of a healthcare professional in order to rule out Alzheimer's or other neurological problems that go beyond difficulty concentrating. This is an aspect of menopause that is still being researched. Keep reading to learn more about the current state of research on difficulty concentrating. Taking estrogen in combination with progesterone may increase negative cognitive side effects, including difficulty concentrating. The exact mechanism of how menopause affects cognitive function, including difficulty concentrating, is a topic that is still somewhat mysterious and currently under debate. A great many universities and other scientific centers are conducting research. Difficulty concentrating is only one side of it. Links between reduced levels of estrogen and Alzheimer's have been found, though contradictory to this are other studies that show that hormone replacement therapy (HRT) provides no benefit in terms of cognitive disorders. The timing, dosage, and menopausal stage are all important factors to consider. What is clear through research is that there is a direct correlation between estrogen and certain neurotransmitters in the brain that regulate cognitive function and memory. 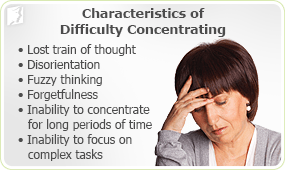 Click on the following link to learn more about this and the other causes of difficulty concentrating. Struggling to concentrate is one of the lesser known symptoms of menopause, even though it's one that impacts a woman's life on a day-to-day basis. Read on to understand why many women experience difficulty concentrating during perimenopause, and discover what can be done to maximize concentration. Difficulty concentrating, though a common occurrence during menopause, can be irritating at the best of times. But when it progresses into anxiety episodes, it can have a negative impact on your daily life. Find out more about how to manage these symptoms through simple, subtle lifestyle changes.